?This is the ideal gift for all women. Choose the Amazon gift wrapping option, Surprise her with this leather bag as a Christmas, Birthday and New Year gift, they will receive the warm greetings and wishes? 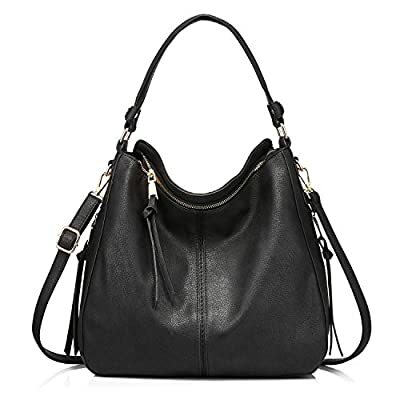 ?Classic Retro hobo handbags, with top zipper closure, fashionable and practical ?Unique side pocket design is easy for you to put into some small items, gold zippers are smooth with elegant tassels decoration. ?Material: PU leather, environmentally-friendly synthetic material. ?Large capacity: enough capacity is perfect for shopping,travel and business. Multi-pockets can help to organize your daily items,even iPad, A4 magazine. Back zipper pocket can hold your personal things, such as lipstick, hand cream and perfume ?Dimensions: 13.8" x 5.1"x 11"(L x W x H). It can be used as a casual shoulder bag or a awesome crossbody bag. Handle height: 9.8". Shoulder strap length : 51.18"